The song on YouTube, and more below the fold. According to Army medical officials, the new Re-Engineering Systems for the Primary Care and Treatment of Depression and PTSD in the Military program is designed to help providers recognize warning signs and treat those disorders early while eliminating Soldiers' fears about the stigma of psychological illnesses and their treatment. Program officials say RESPECT-MIL takes advantage of any visit Soldiers make to their assigned primary care physicians for any reason, turning those visits into opportunities to detect symptoms that could indicate that the Soldier is struggling with PTSD. "The Army is doing a lot more as far as trying to reach out and find Soldiers who are having issues but are reluctant to seek mental health care due to the historical mental health stigma within the military," said Dr. (Maj.) David Johnson, a Schweinfurt Health Clinic psychiatrist. The Rural Veterans Access to Care Act, which would launch a three-year pilot program in selected regions (including the home of its sponsor, Kansas Rep. Jerry Moran [R-KS]) giving veterans in remote areas the chance to access health benefits from local non-military providers, was given the green-light by the House Committee on Veterans Affairs. Next stop: a full House vote. The VA is launching a pilot advertising program in Washington, DC., to broadcast the news that "It takes the courage and strength of a warrior to ask for help." 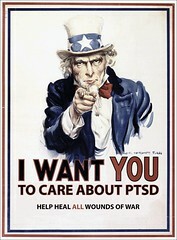 The aim of the blitz is to get the word out on their veterans helpline number, 800-273-TALK (8255). Thanks go to Congressman Harry Mitchell [D-AZ], Chairman of the Veterans’ Affairs Subcommittee on Oversight and Investigations, who pushed the VA to become active rather than passive in engaging veterans. View the VA's public service announcement, featuring actor Gary Sinise urging suicidal vets to seek help, below the fold. Meanwhile, following a continuing spate of recent OEF/OIF veteran suicides (including six being cared for by Spokane's VA), Sen. Patty Murray [D-WA] will take to the floor of the Senate this afternoon to call for more from the VA than a mere ad campaign can offer. Time for the speech is not set in stone, but will not be before 5:00 PM ET/ 3:00 PM PT. C-Span 2 is set to carry it live in Washington State, and I believe should cover it nationally as well. This month marks the one year anniversary of the opening of the Fort Bliss Restoration and Resilience Center in Texas. Back in May, Secretary of Defense Robert Gates visited the groundbreaking facility, which offered up the first test of the Army's new holistic Warrior Resilience Program, saying, "This center here is illustrative of what can be done." The one-of-a-kind program offers its participating Afghanistan and Iraq veterans group and individual therapy sessions with meditation, yoga, acupuncture, massage therapy, chiropractic and hot-stone therapy treatments. Building on all of this, it's great to see that Army Chief of Staff Gen. George Casey, following a visit to Fort Bliss last week, seems to agree with the movement. An array of studies by the Army and outside researchers say that marital strains, risk of child maltreatment and other problems harmful to families worsen as soldiers serve multiple combat tours. For example, a Pentagon-funded study last year concluded that children in some Army families were markedly more vulnerable to abuse and neglect by their mothers when their fathers were deployed in Iraq and Afghanistan. For the Army, especially, the challenges are staggering as it furnishes the bulk of combat forces. As of last year, more than 55 percent of its soldiers were married, a far higher rate than during the Vietnam war. The nearly 513,000 soldiers on active duty collectively had more than 493,000 children. We are currently recruiting research subjects to participate in either of three federally funded research protocols conducted in Manchester, NH and Boston, MA. Is there a way that we might solicit participation from your readership? Specific details, contact info in extended.